Tokyo Dome City, Prism Hall, Japan. Eight hours ago the 2015 Cardfight!! Vanguard world champion was crowned at 4:00 PM JST, marking the ascent of the first nonhuman title holder. The new reigning world champion is three-year-old Barcgal, a female black Labrador Retriever of American origin. Barcgal won the championship title while maining a Royal Paladin deck, using a popular variant on Thing Saver Dragon that incorporated Soul Saver support to build soul for Thing Saver's legion skill. Examining her decklist closely, it appears to be a card for card copy of Yukiya's second place deck from last year's fourth Tachikawa VGCS. Barcgal's success was given a partial explanation by her trainer; due to her absence of opposable thumbs and inability to speak, the dog was able to claim disability and rely on an assistant to hold her cards for her. Her trainer assured us that Barcgal's decisions in her cardfights were all her own, as "in best-of-one, even a dog can win Worlds." Barcgal has spent the last three years training for the world championship, having first learned to play the game when she was only three months old. Black Labradors have a reputation for extraordinary intelligence, but international runner-up Almeida Stewart criticized the pup for her victory, claiming that Barcgal was only able to win by checking critical triggers every turn of the game against gradelocked opponents. Barcgal's decklist is provided further down. In other news, Bushiroad of Japan's weekly NND broadcast has revealed the most recent entry in the grade 3 revival campaign, a Shadow Paladin grade 3 that will legion with Dark Metal Dragon, one of the clan's original boss cards from BT04: Eclipse of Illusionary Shadows. The revival legion will be printed as a triple rare in the upcoming G-BT03: Sovereign Star Dragon, turning aside previous speculation that Gold Paladin would receive the set's revival. 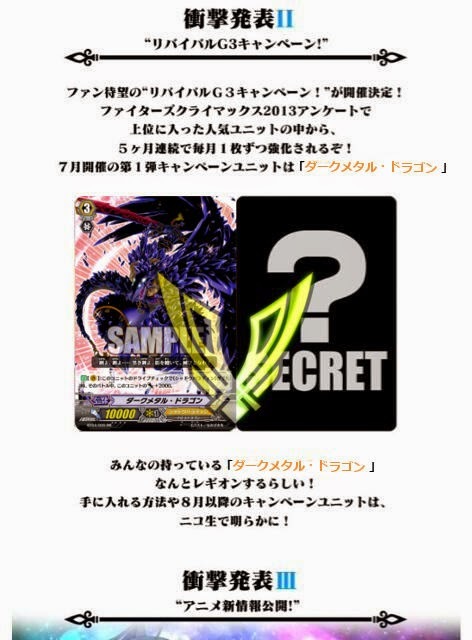 Dark Metal Dragon was originally printed as a double rare and special parallel in BT04, and according to the announcement will not be reprinted in G-BT03. Instead, one copy of Dark Metal will be printed with alternate artwork in the June issue of Monthly Bushiroad magazine. Regarding the revival, we at Cardfight Pro were able to secure a phone interview with Nakamura Satoshi, one of Cardfight!! Vanguard's preeminent game designers. The full audio and transcript of this interview will be available around the 31st, while a partial account is provided below. "We really wanted to replicate the feel of 2011 Shadow Paladin for its fans." Mr. Nakamura explained to us, citing total agreement from his team on the direction of the upcoming booster set. "It's like an ice cream cone that you were about to eat, and someone runs by and knocks it out of your hand." "That's what Shadow Paladin is really like?" "A vanilla ice cream cone." At this point in the interview Mr. Nakamura began to laugh. "No, maybe it's more like...like going to Foster Freeze for chocolate ice cream, but they're out so you're forced to get vanilla or the trip is wasted. But then, just as you're about to enjoy your vanilla ice cream, this group of Singaporean mimes come along in a clown car and knock it out of your hand, honking and making a lot of noise and driving the car like they're at a monster truck rally. It's not even their car! They stole it from the clowns! It's so frustrating, and that's what Shadow Paladin is really like. So I wanted to properly communicate this feeling with cardfighters all over the world. Please continue to enjoy our Cardfight!! Vanguard trading card game in the future."